This brightly illustrated book has wonderful vocabulary to describe the power of the sea. Students learn that the sea is able to “scatter stars in the sand” and “change colour with her moods.” The two page illustrations add to the text, allowing for discussions about the meaning of the words. Students will be able to make connections between the book and their own experiences of the sea. This is a wonderful book for reading aloud as an introduction to a seashore unit. 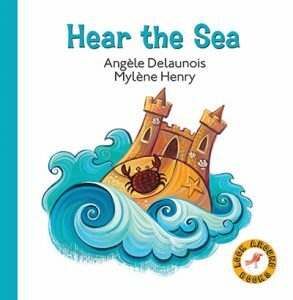 Classroom Connections: Hear the Sea would be an excellent book for developing imagery. Reading the book aloud without showing the students the illustrations would provide the opportunity to discuss what they think the illustrations would look like. Since the ocean is referred to as “she” throughout the story, students could discuss what “she” is. Using the style of writing in Hear the Sea, students could write poetry about their experiences of the sea. The use of colour and style in the illustrations could provide inspiration for an excellent art lesson as well. This review is from Canadian Teacher Magazine’s Apr/May 2017 issue.